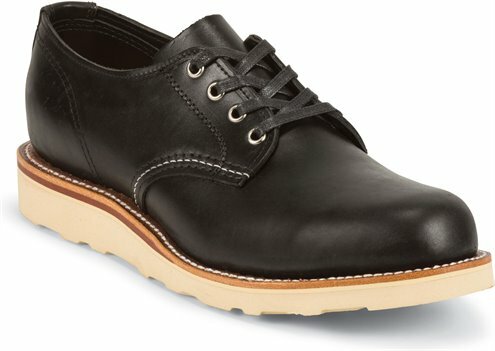 The Black Whirlwind General Utility Plain Toe Oxford Shoe is a 4-inch tall men's shoe that's simple and sophisticated. The polished black leather exterior features black waxed cotton laces and subtle white stitching along the vamp. It has Texon® Poron cushioned maple leather covered insoles that offer lasting comfort and support and the wedge outsole provides traction and lightweight stability so you can confidently step into any occasion.